Excellent PC version: great performance, many graphics and controls settings, Oculus Rift support, and editable game XML files. 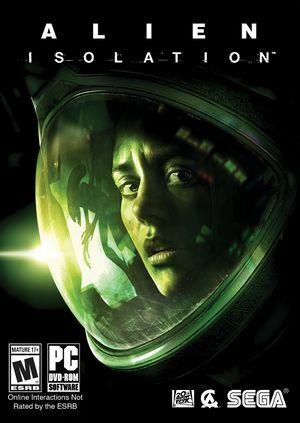 PC version lacks a voice detection feature from the console versions where the player must maintain the microphone's noise level during the game. The anti-aliasing that ships with the game is rather poor but can be improved. See Anti-aliasing (AA). Part of Season Pass and Collection. Delete or rename AMD_IDENT.USM, CA_IDENT.USM and FOX_IDENT.USM. Download Save confirmation dialog skipper for Alien: Isolation. Unpack winmm.dll and AlienIsolation.SkipSaveConfirmationDialog.asi to the installation folder. Game supports 2 manual save files and will create an automatic permanent checkpoint save at the beginning of each chapter. Loading a chapter save will automatically overwrite your manual save file. Use Flawless Widescreen to center the HUD. Up to 16x, but doesn't cover all textures, it is recommended to prefer driver level AF. FXAA, SMAA T1X, SMAA T2X (unavailable in SLI/Crossfire). See Anti-aliasing (AA). Cutscenes are pre-rendered at 30 fps. No frame rate cap. Audio during death scenes may be silent when the frame rate is over 100. Supports 10-bit output via HDMI Deep Color option. Does not support HDR. Slider ranges from 47-75° vertical, with the higher FOV on the left side of the slider. Slider is using vertical FOV. See FOV Calculator for help. Slider can be customized to have different selectable values. See Menu Customization. FOV higher than 55° makes the player character's legs and feet disappear. FOV is locked at 47° during real-time rendered cinematics and when using terminals. SMAA which shipped in the game isn't enough to remove the high intensity aliasing on edges of shiny surfaces. Download and extract Alias Isolation. Follow the displayed instructions and click Launch. The Steam version should launch automatically. Alias Isolation also includes a modified version of the Cinematic Tools mod, which allows for camera and post-processing control, time freezing, and a few other extras. This method only works on Nvidia graphics cards. Open the Alien: Isolation Nvidia profile with NVIDIA Profile Inspector. Change Ambient Occlusion compatibility value to 0x00060000. Change Ambient Occlusion setting to Quality. Change Ambient Occlusion usage to Enabled. Press "Apply Changes" in the top-right corner. In-game HDAO needs to be disabled. A Ukrainian fan translation is available. 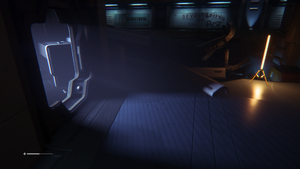 Use Helix Mod: Alien: Isolation. "Alien kills Ripley" death scenes. Download and install MSI Afterburner with RivaTuner. In RivaTuner, create a new profile for (AI.exe). Limit frame rate to 105 FPS and enable Custom Direct3D Support for (AI.exe) in RivaTuner. It is possible that there are other, higher frame rates than 105 FPS that also fix the issue, but this is unexplored. If limiting to 105 FPS doesn't work, try lowering to 100 FPS. When using a flamethrower or plasma cutter, there is a chance that the whole screen will become excessively bright and blurry. The issue is likely connected with the trainer for the game. Game plays normally but crashes every 10 to 15 minutes on Windows 10. This issue is caused by a touch screen keyboard service. Identify TabletInputService (Touch Keyboard and Handwriting Panel Service). Disabling this service won't disable your touchscreen, but may disable the use of your touchscreen's keyboard. Go to the DATA folder of the game. Delete or rename the LENS_FLARE*.bin files. By editing engine_settings.xml, in-game video options are easy to modify, and changes will be reflected in the game's menu as well. <Quality , followed by the name= which is reflected as the setting name you see in-game (i.e. HDAO). Next is the actual value, which can be a int, bool, or float. The line content then ends with a precedence= which determines the order of the Quality items. A higher number means the item is more on the right. So precedence=2 will be the next item after precedence=1. Now customize the lines in between. For example, remove every of those lines and insert <Quality name="75" float="47.0" precedence="1"/>, <Quality name="80" float="51.0" precedence="2"/> and <Quality name="85" float="55.0" precedence="3"/>. The FOV slider now has three possible settings: A horizontal FOV of 75, 80 or 85. It is possible to greatly increase planar reflections (floor reflections). Locate line <Quality name="On" int="3" precedence="2"/> and change it to <Quality name="On" int="6" precedence="2"/>. Beneath line <Quality name="On" int="3" precedence="2"/> add line <Quality name="Increased" int="6" precedence="3"/>. This change of visuals is highly dependable on personal taste. Refer to the original guide for screenshots that show the enhanced "shinyness" of the floor. In-game settings allow for a maximum shadow map resolution of 2048. It is possible to change the settings and increase the value. Locate line <Quality name="2048" int="2048" precedence="4"> which represents the maximum vanilla shadow map resolution. 4096 is not the max value. However, there are almost no noticeable differences above this value. Increasing shadow map resolution introduces shadow flickering in some areas. Default Level of Detail setting even on Ultra results in excessive object pop-in which can be rectified. Default SLI compatibility bits do not scale properly in certain areas. Use alternative bits to improve performance at expense of some minor UI & light shaft flicker in places. Light shaft flicker when using this fix appears to be itself fixable by increasing shadow map resolution to 4096. See Increased Shadow Map Resolution. The minimum requirements are quoted for all settings on "Low" at 800x600 at 30fps. 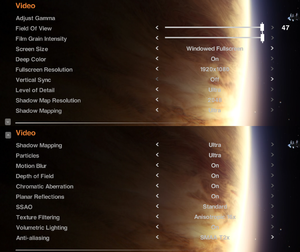 The recommended ones - for all settings on "High" at 1920x1080 at 60fps. The following graphics cards are not supported: AMD Radeon HD 4xxx series, ATI Radeon X1xxx series, ATI Radeon HD2xxx series, Intel Iris 5100, Intel HD5000, Intel Iris 6100, Intel HD6000, Intel HD5300, Intel GMA series, Intel HD3000, Intel HD4000, Nvidia 1xx series, Nvidia 9xxx series, Nvidia 8xxx series, Nvidia 7xxx series and Nvidia 3xx series. Requires an Nvidia GeForce 600 series graphics card or better running driver version 355.11 or better. Intel and AMD GPUs are not officially supported. ↑ LOD Tweak | Guru3D.com.